As if perfectly synchronised with the greater public’s mood after a hot, sunny weekend filled with swims in crystal clear waters at the beach with blue skies overhead, today in Melbourne, at the start of the working week it is grey and pouring with rain. But I prefer to think of my next beach trip instead of dwelling on that fact. Several years ago I bought this beach cover-up at Savers for a grand total of $2. It is getting harder and harder to find genuine vintage gear at op shops, but that’s a subject for another post. Anyway, I’m guessing this was from the 60s or 70s. Check out the label! 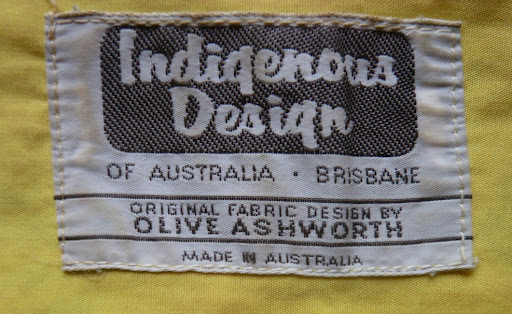 I have to admit that I have only just now looked up who Olive Ashworth is and am very happy I held on to this jacket as it’s a little piece of Australian textile history! 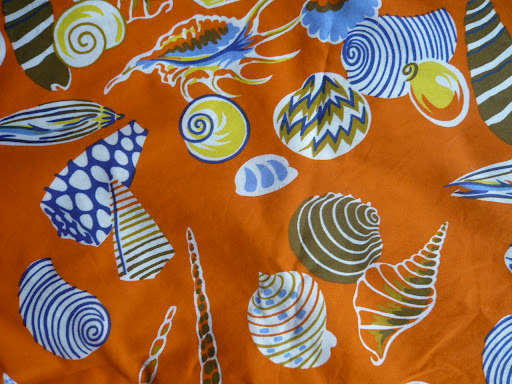 Here’s a close-up of the seashell print. 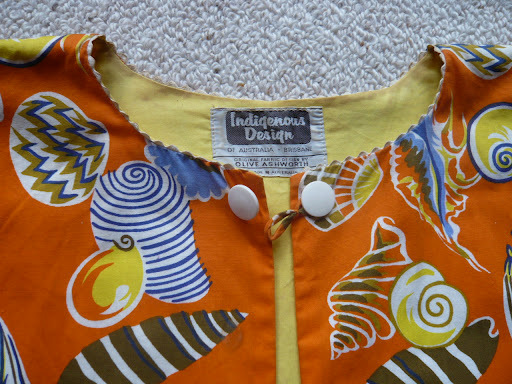 And look at the button closure at the neck – just two buttons and a loop that can go over either of them (ie the loop is like a figure 8 and is not attached to anything). Ashworth designed a bit for Signature Prints, the interior design company established by Florence Broadhurst, about whom there are at least two biographies – highly recommended and very entertaining reading as she had an amazing life (although much of it could not be verified – a bit like an Australian Chanel!). Here’s what the jacket looks like when it’s worn. I’m somewhat ashamed to say it’s been sitting in my cupboard for years! 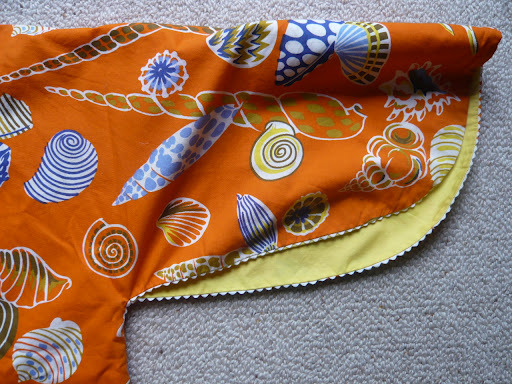 I love this sleeve detail – the underside of the sleeves has been left unseamed but edged in ric-rac. And the yellow lining is so sweet! 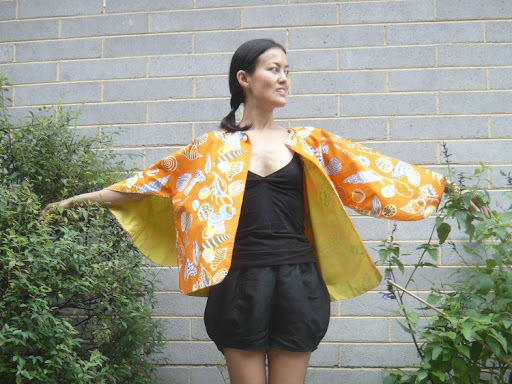 I’m thinking I’ll try wearing this with a belt around the front and fed through the underarms to the back (inside the jacket) so that the back hangs free – yes, I should have taken a photo to show you what I mean! Maybe during Fashion Week… it’s not far off now! 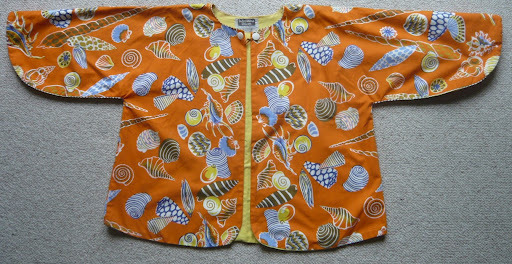 What a lovely top – thank you for sharing. Looking forward to seeing it worn with a belt. It looks absolutely fantastic. The shell design is just perfect!It was fascinating to learn about the designer, too. Imagine travelling from Brisbane to Melbourne to study art as a fifteen-year-old! She was clearly dedicated to her craft from an early age.